These mini apple tarts, piping with fresh apples and sheets of puff pastry, are a snap to prepare. Apricot preserves and a touch of honey or maple syrup and lemon make up the glaze for the tarts. The pictured tarts were made with a 10-by-15-inch sheet of Pepperidge Farm brand puff pastry. One sheet of puff pastry (from a box of two sheets) makes four pastries, roughly 2 1/2-by-3 1/2 inches in size. Plan to take the puff pastry out of the freezer about 25 minutes before you begin preparation. This dessert is an excellent way to enjoy fresh apples, and you'll have delicious apple tarts in less than 45 minutes. Run a pastry crimper around the edges of the pastry squares for a fancier look. 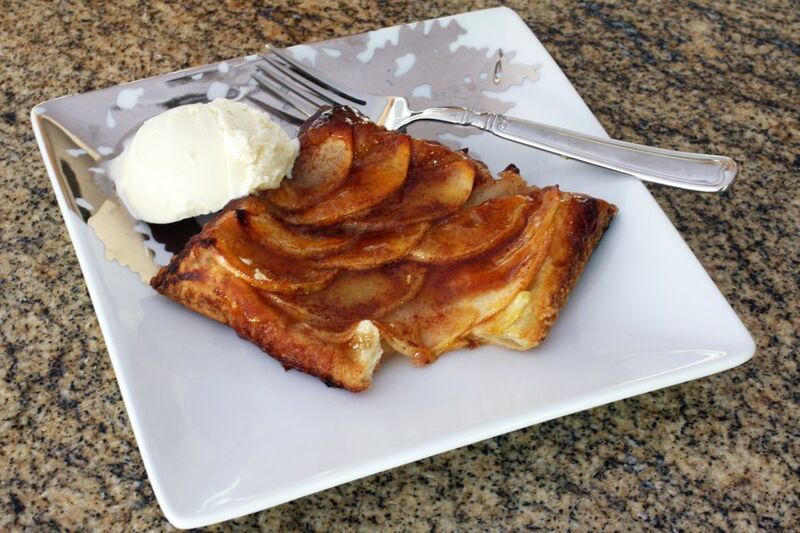 Serve these easy puff pastry apple tarts with a scoop of ice cream or drizzle with cream. Line a large rimmed baking sheet with foil and then top the foil with a sheet parchment paper. Or, use nonstick foil. In a small bowl, combine the granulated sugar and brown sugar with the cinnamon; blend well and set aside. Cut the sheet of puff pastry evenly into 4 squares. Arrange the pastry on the prepared baking sheet. Prick in several places with a fork. Place the baking sheet in the refrigerator or freezer while you prepare the apple slices. Peel the apples; core and cut into wedges. Slice the wedges thinly and arrange the slices over each square of puff pastry to create a diagonal pattern of overlapping slices. Sprinkle the apples evenly with the sugar mixture. Cut the butter into small pieces and scatter them over the apples. Bake the tarts for about 25 to 30 minutes, until the pastry is golden brown and the apple slices are tender. The sugar and juices from the apples will run off and burn slightly, but will not affect the flavor. Meanwhile, combine the apricot preserves, lemon juice, and honey in a saucepan over medium heat. Bring to a boil. As soon as the tarts come out of the oven, immediately transfer them to a parchment or foil-lined surface. Put the hot preserves mixture through a sieve if very lumpy, then brush the mixture generously over the tarts to glaze. *A package of frozen puff pastry is roughly 14 to 18 ounces, depending on brand. **If you don't have honey, use maple syrup or golden syrup instead.